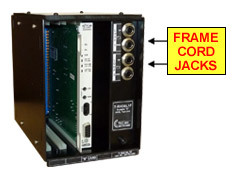 ► TAG's (PN # T-RHDSL1F) Portable “R” - HDSL Test Unit w/ Frame Cord Jacks allows both Central Office and OSP Technicians to quickly verify T1 HiCap circuits. 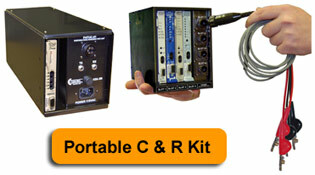 It is lightweight and has (1) slot for 2W / 4W HDSL cards. 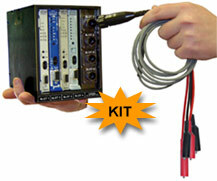 Cords are available to connect at various interface points (CO Frame, Cross Box, CPE) for “good sync” verification. 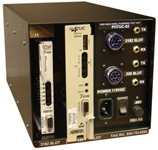 Utilize the craft port on the HDSL card to examine span stats, margins and attenuation. The T-RHDSL1F is a powerful tool for installing and maintaining T1 HiCap circuits. 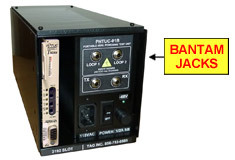 ► TAG's (PN # PHTUC-01B) Portable "C" - HDSL Powering Test Unit w/ Bantam Jacks is compatible with 3192 HDSL "C" Cards. It temporarily powers an HDSL loop to verify new HDSL installation or troubleshoot HDSL troubles.